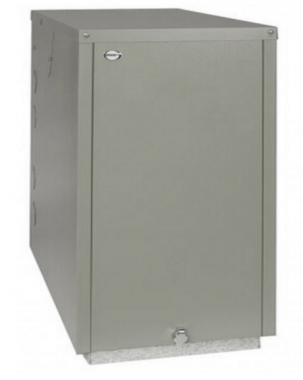 The Vortex Pro Combi External 21kW Oil boiler is a highly reliable condensing unit. It is a floor standing boiler which has been designed and manufactured by Grant. As it’s an external unit you do not need to take up valuable space in your home which is particularly beneficial for smaller properties. In addition, it is a Combi boiler so doesn’t require an external water tank or cylinder; everything is wrapped up in one cost effective unit. This boiler has an efficiency rating of 90.8% making it an A rated unit. The output rating of 21kW makes the unit perfect if you live in a property with only one bathroom and do not a high demand for heating or hot water. Key features and benefits include the neon diagnostic circulating pump, unique Grant Vortex stainless steel heat exchanger, Riello RDB burner with plugs and socket connections as standard. It also includes a 4 litre expansion vessel as an externally fitted vessel kit. The boiler is quick and simple to install with no complicated wiring or plumbing needed which should help to save you money on your installation bill. This unit has been awarded a Which? Best Buy accreditation so you can be sure you're getting a reliable unit. It is available in 4 different output options including the 21kW, 26kW, 26kW XS and 36kW. This means you can be sure that there is a unit in the range to suit your home. A standard 5 year guarantee is included to give you peace of mind that this boiler will not let you down.